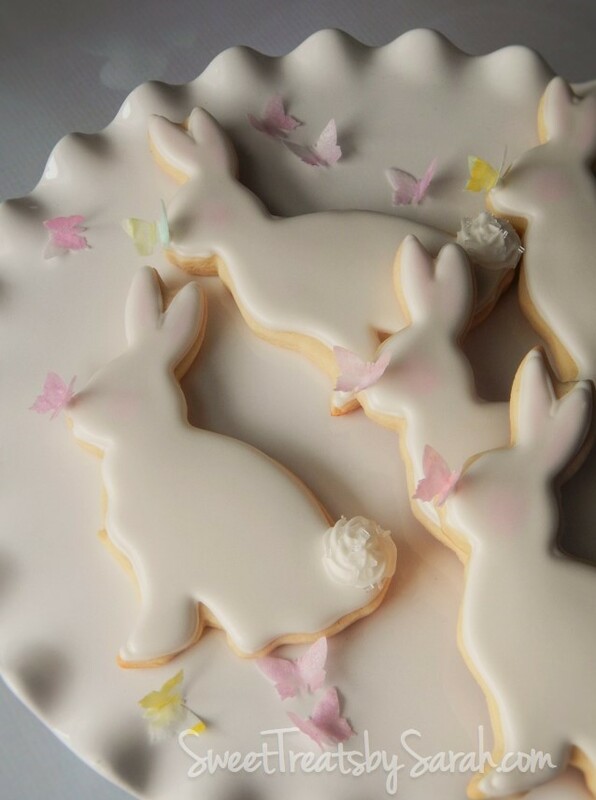 These easy to decorate bunnies make such a pretty addition to your holiday table! The delicate little butterflies kissing he bunny's nose is made from wafer paper using a butterfly punch (I believe I purchased that particular one at Michaels). I added a little color to the wafer paper using a very small amount of food coloring. Note: to much water/food coloring will melt your delicate wafer paper. I also added some rosy cheeks with pink petal dust. NOW FOR THE FUN STUFF! It seems like forever since I had a GIVEAWAY!!!! I'm just so flattered to have such wonderful readers and I just noticed there are over 500 likes on my facebook page! So as a thank you, I'm giving away 2 Dozen Spring Cookies!!!!! You can enter below now thru 4/8 and winner will be announced on the 9th!!!! Contest is open to US residents only. Thank you, I entered and I just love your work! Usually when you see something that says" easy to decorate" it is still well beyond my ability, but I could pull this off. I entered! thank you so much! look delicious and I entered! I entered..love the unicorn cookies! I Entered the! Thank you. Congratulations on so many followers! Entered and fingers and toes crossed. My hubby is a cookie addict! Such a nice giveaway! Thank you! I entered! Thanks for the chance! These sure do look delicious!! Thanks for the chance can't pass down getting cookies! You have some awesome looking cookies! Thank you for the chance to win! These are so yummy looking! Thank you for the chance. Thank you! Such cute cookies. I entered.